Let’s talk about the big picture. Specifically, your big picture. When you see the big picture doesn’t it make things easier? Clearer? Certainty comes from the big picture. So does motivation, excitement, purpose and power. The slippery bit is how easy it is to lose sight of the big picture. And sometimes when you take your eye off that perspective it can be hard to lift yourself out of the immediate and the urgent to regain that big vista vantage point. That’s why I want to draw you some Doodles to Noodle: A set of small pictures with big power. Two-dimensional touchstones that keep the magic of your big picture right in front of you. Some DOODLES to NOODLE, what can this mean? Approaching the subject with zeal and with mirth. You are the center and source of these arts. Conduit, questioner, those are my parts. Together we’ll laugh and share and explore. When you open your heart and feel free to be. Where dreams are kept safe and no word is mean. And then I’ll make art, that I’ll draw just for you. Doodles with meaning – not found in stores. Do you remember Snow White and that old Evil Queen? The Queen wasn’t so nice, but she had that rad magic mirror. What if you could have your own magic mirror? What would you tell it? What would you ask it to show you about you? Doodles to Noodle is a service like none other. It’s like having a chance to have a really deep conversation for 90 minutes with your magic mirror and then getting to see what it could show you: reflections of yourself through the lens of your own aspirations and inspirations. Even better than reflections, you get to keep the images. Pssst… I have a secret – these pieces of two-dimensional doodle artwork are actually multi-dimensional talismans in disguise. Each drawing resonates with energy that you absorb through the noodling, the mulling in their presence, the living with them over time. 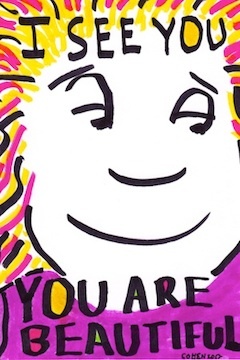 You should put these doodles where you can see them every day so that you are consciously and subconsciously reminded of the power of you. The beacon you shine when you allow yourself to be open to your own power and potential is a radiant glow. That glow is what I tap into during our magic mirror conversation, and then I distill it and refine it so that I can channel it into the drawings. The doodles-to-noodle are infused with your special signal, becoming charged like magic amulets that nourish and guide you through your challenges, growth and transformation. When is the right time to do this? Let me ask you: When is it helpful to have a reminder of what you care about, what your powers are, what truly drives and motivates you? When does having a reflection of your own personal vision of awesome become a valuable and necessary asset for you to have? The plateau: When you feel that you’ve come a long way, but aren’t satisfied with where you are and aren’t finding your way to the next level. These are times when Doodles to Noodle can help you see things about yourself that you may have only felt before, things that can help you shed what is holding you back and help you invest in what you need to go forward to realize what you aspire to as awesome. The crossroads: When you find yourself faced with consequential opportunities that point you in different directions – these are times when the doodles become your compass making it easier to read the map and decide which path takes you toward your goals and which will lead you astray. Prepping for the climb: Whether you are at the foot of the mountain about to climb to the peak, or about to launch a new adventure in your career, it is a time for preparation. A time to balance what you can carry and what you need to survive and reach the top. A time to assess the risks you are willing to take and the life lines you will not compromise. Doodles to Noodle help you see the big picture so you can put all these decisions in perspective. So you don’t run out of rope when you are halfway up that mountain, or worse, realize that you are climbing the wrong peak. Swimming against the current: When you find yourself alone in bucking conventional wisdom. 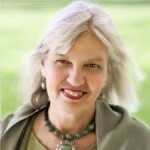 When you can’t seem to find anyone who shares your vision, but you are driven to move forward despite the naysayers – this is when Doodles to Noodle can help you find the affirmation that bolsters your confidence so you can drive forward, or show you that you may be clinging to a limited interpretation of your own patterns and the potential they hold. Thus either strengthening your resolve or opening you to find a different answer that is still true for you, but also aligns for the people who are only clumsily showing you their care through their doubts and worry. 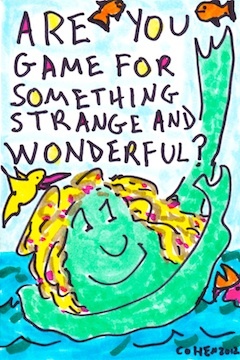 Are you game for something strange and wonderful? You’ll tell me some preliminary things about you and where you’re at right now. Just a few notes from you so I can prep a little. We’ll have a 90 minute phone session: call it the magic mirror conversation. I’ll be the mirror, but to “see” you from many perspectives I’ll need to guide the discussion and ask lots of questions. We’ll cover a lot of ground. It’s kind of intense, but fun and satisfying too. After absorbing our discussion and mulling over my notes I’ll go into my studio and make three pieces of original doodle artwork exclusively for you – three doodles that reflect fundamental aspects of you so that you can ponder, noodle, and reconnect with your inspiration. I’ll finish the doodles-to-noodle within two weeks of our magic mirror conversation and then I’ll bundle the art with care and mail it to you. You’ll open your package and see what’s inside: A portrait of your future self? A reminder of your superpowers? A celebration of you in charge of you – defining success by your own measure? That depends on you and our conversation together. Remember, nobody else gets to see your doodles unless you choose to show them. They are private and personal visual touchstones made to guide and support you in your journey. Here is an example set of Doodles to Noodle (shared with permission from the client). Doodles to Noodle costs $650. That includes the magic mirror conversation, three original drawings and shipping to anywhere in the US or Canada. I want them now, setup my call. Get your Doodles to Noodle. These are not portraits or caricatures. The artwork I’ll create is highly personalized because of the groundwork we’ll both put into it. This is a very special and empowering conversation. The magic mirror conversation is a safe, respectful container where you can share the patterns inside you, the passion, motivations and strengths that urge you on. It is a chance to be seen and to be heard and to show me your innermost vision for yourself. My job is to look through the telescope inside you. To see things from where you stand, at your angle, acknowledging what you see for yourself, not trying to swing the lens around to point it somewhere else. This is a unique and remarkably personal art experience. I’ll be making this art just for you. You can’t walk into an art gallery and buy this experience. You may find there art that speaks to you in other ways, but they won’t be like Doodles to Noodle. These doodles are your tools and your talismans made to your measure, to fit and support you and only you as you grow toward your personal definition of awesome. 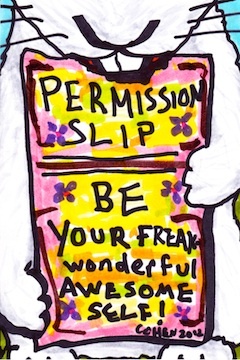 This is a powerful permission slip. One of the interesting things that happens in this process is that you see things that you know are inside, but can’t always put into words or easily show other people in a way they can understand. 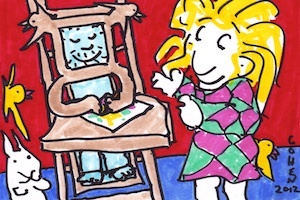 Seeing yourself in these doodles – is like accepting the magic you bring to what you do. It affirms the viability of your vision because these images are grounded in the reality of the behaviors and patterns inside you. The result is that you will feel lighter – unburdened by other people’s doubts, their “musts” and “shoulds” that have been weighing on you and working against you has you strive to live your purpose. This is a calibration. Once you have your Doodles to Noodle it is like having a compass that has been calibrated to always point you to where you want to go. The doodles are there to always remind you of your vision for yourself, letting you glimpse whenever you want (or need) to be reminded of who you are when you are shining your best self. When faced with critical decisions or consequential impasses, turn to these doodles and reconnect with your center and you may find the choices become simpler and clearer. See an example set of Doodles to Noodle (shared with permission from the client). I want to start, so let’s begin. 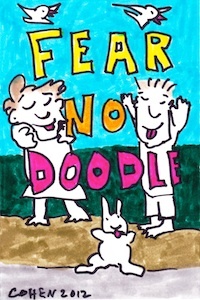 Signup for Doodles to Noodle.